It's the Rheo Thing: Together at Last! Exciting times in Akron. 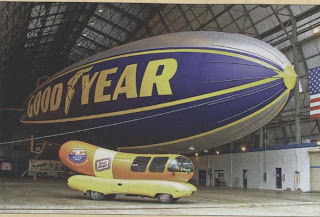 This photo (courtesy of Rubber and Plastics News - Nov. 17, 2008) features two of the longest living coporate icons together in one spot for the first time, despite the blimps being around since 1925 and the Weinermobile being around since 1936.